As any modern day developer knows, location is important. But once the prospective buyer decides on the location, what is going to get them to decide on his project? The Riverside Improvement Company headed by E.E. 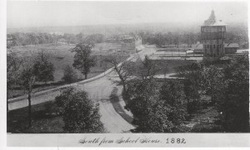 Childs, used design and technology to sell lots in their new project along the Chicago, Burlington and Quincy railroad. Designed in 1869 by William LeBaron Jenney, the young military engineer Olmsted had met at the siege of Vicksburg during the Civil War. The Riverside Water Tower was a technological marvel of steam driven pumps providing a safe, reliable water supply to village residents. The water tower served as a beautifully designed advertising piece, calling attention to the passengers on the trains stopping at the station, that something special and different was growing here along the Des Plaines River. The tower also provided an observation platform from which lots could be sold by taking prospective purchasers up and showing them how their new house could be situated in relation to the City of Chicago visible to the east. Located near the center of the planned development, the Riverside Water Tower was one of the very first projects undertaken by the founding Riverside Improvement Company. The design and construction of a central water tower would ensure a clean, adequate water supply for the new community. Prior to construction of the tower, the community had depended on a central wooden water tank, the water piped through wooden mains from a well in the northern part of the village, and water was carried by residents from the tank to their home. 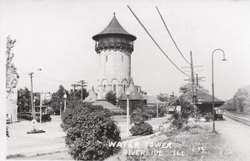 As the Riverside Improvement Company’s Description of Riverside states, the new water tower was built “to insure an abundant supply of water to every dwelling in this elegant suburb”. 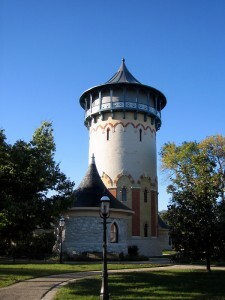 The water tower was designed by William LeBaron Jenney in a Swiss Gothic style, a style shared in part by the Riverside Hotel (built in 1871) and by many of the original 1870s homes. Jenney, a noted Chicago architect whose work includes the Home Insurance Building (the first steel-supported skyscraper) and the Manhattan Building (431 S. Dearborn, Chicago, Illinois), also supervised the overall construction of the Olmsted and Vaux plan for Riverside and designed many of the first Riverside homes. The tower was built on a sloping stone base, and clad with red and cream brick up to a wooden Swiss Gothic decorative treatment capped by a cone shaped slate roof to a peak lightning rod iron finial. Surrounding the original wooden water tank was an iron observation balcony nearly 70 feet high, a popular place for residents to view downtown Chicago, nine miles away. An engine room in the tower monitored the steam pumps used to pump water from the 1,378 foot well. Water rates were set by a water committee, and based on the size of the house: the Riverside Hotel’s monthly water bill was $10. In 1875, the annual budget for the water works was $1600, which included an engineer’s salary, coal supplies, and repairs. The village took great care to upgrade the water works, spending $350 in 1875 to replace the slate roof, and $785 to replace the wooden water tower in 1891-1892. As the village grew, a new well was bored in 1882, and another well, with a depth of 2,000 feet, in 1889, at which time a reservoir was constructed. In 1898, the East and West Well Houses (designed by G. W. Ashby) were built, and in 1901, a new pump house (also an Ashby design) was constructed and a modern pumping system installed. 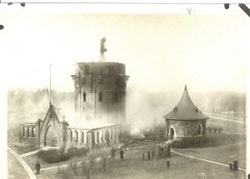 Tragically, in the early hours of New Years Day, 1913, a fire destroyed the wooden tank, the pump house, and much of the upper stories of the tower. A vivid description by the railroad night operator in the Burlington depot likens the flames at the top of the tower to a candle. Although the fire department arrived within minutes of the operator’s alarm, insufficient steam power in the boiler prevented water reaching high enough to save the wooden portion of the tower, which collapsed into the engineer’s room. 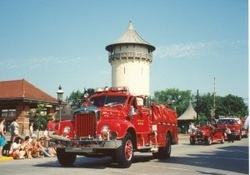 During the days after the fire, bottled water was brought in, tank wagons were used to bring water to the village, and a fire hose was used to draw water from the neighboring City of Berwyn. Later, temporary motor-driven pumps were installed to supply Riverside water mains from ground wells and a ground storage tank, and a connection was made with the Berwyn water system at through a main at Quincy and Harlem. By the fall of 1913, architect William Mann had submitted a plan for a rebuilt tower that added twenty feet to the structure and replaced the wooden tank with an iron one. The Village Board quickly approved an issue of $35,000 in water bonds to erect a new, electric-powered water works. The new pump house contained the first fully automated, electric switchboard for a waterworks installed in the United States. By 1922, an additional well was needed, which ran to a depth of 2,047 feet. In 1925, the system was modernized and mains extended to the new divisions being built at that time. Through the years, the water complex has been put to different uses. In 1901, the Chicago Telephone Company rented the east well house as a telephone station. In 1969, the Riverside Historical Society moved in the east well house, and the Recreation Office moved into the pump house in 1999. In 1990, a fire in the pump house resulted in extensive repairs, including the removal of the engineer’s attic apartment to provide additional office space and the redesign of the front entrance. In 2005, work started on a major construction project to restore the water tower to its 1913 appearance. The offices in the pump house were relocated to the Public Works Facility across the Des Plaines River in Riverside Lawn. The work include digging a moat around the tower to contain the lead based paint that was removed. The work crews had to construct a scaffold that completely surrounded the tower structure all the way up to the lower roof line. The extensive work included removing all the paint from the brick and masonry of the tower and pump house. Tuck pointing, then sealing the brick surfaces, repairing the roof, windows and painting the metal tank at the top of the tower. The slate roof on the west well house was redone in new slate to place the large holes in the roof that had materialized in years past. It was difficult to find craftsmen capable of doing the work because of the unique pointed cap shape of the roof profile. The total project including repairs to both flanking well houses ended up costing $1.37 million. The renovation garnered a 2006 Design Excellence Distinguished Award from the American Institute of Architects. In June 2006, the Riverside Board of Trustees voted to proceed with an interior remodeling of the base of the tower and attached pump house. Although originally envisioned to be re-purposed as museum exhibit space and an archival library where visiting scholars could research urban planning, the decision was made to move the Riverside Recreation Department into this centrally located building. When the work had been completed, new offices and programming space had been created for the Riverside Recreation Department. Standing at the center of the village since 1869, the water tower has become the symbol of Riverside. It is used as a logo for the village government, and its image has been reproduced as a piggy bank, Christmas ornament, and on athletic gear. Well drilled on Nickerson Farm land in north of Village; wooden mains pump water to central tank for distribution to households. Water tower designed by William LeBaron Jenney. Jenney supervises the construction of the Olmsted plan for Riverside. Ownership of water works and tower transferred to the Village of Riverside. New slate roof installed. Village rules that water will be shut off to anyone not paying their water bill. Village Board authorizes $1,200 for boring an additional well. Purchase of a new pump approved. Bond issuance ($20,000) to extend the water system. Another well constructed to 2,000 feet; reservoir constructed. New wooden water tank and repair of tower by Henry Bradshaw for $785. East and west well houses (designed by G. W. Ashby) built. New pump house (G. W. Ashby) built, with modern pumping system installed. East Well house rented by the Chicago Telephone Co. Exterior painted; $210 authorized for the work. Wood stair to water tank replaced. Fire destroys tower tank, roof, and pump house. With the subsequent rebuilding, first fully automated electric pump control system in the US installed in the water tower. Additional well constructed to 2,047 feet. North well drilled to 1,960 feet. Northgate facility constructed; second floor used as rifle range by police and local gun clubs. Water tower designated an American Waterworks Association Landmark, one of only 12 in the country. Listed in Illinois Historic Structure survey. Two fires destroy Recreation Offices in pump house. Entrance to the pump house is redesigned. Water tower designated Riverside Landmark. Water tank still holds 250,000 gallons of water. Village obtains grant for restoration of the water complex.